JSH Partner Michael Ludwig Recognized in AzBusiness Leaders 2019 | Jones, Skelton & Hochuli, P.L.C. 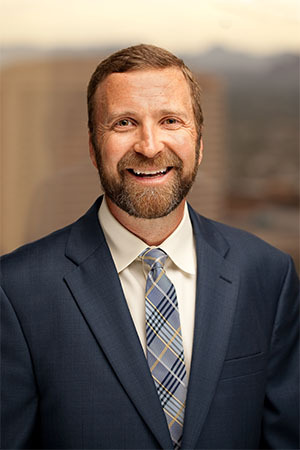 Mike Ludwig earns recognition in AzBusiness magazine’s AzBusiness Leaders 2019 for his work in the area of construction litigation. The editors of AzBusiness magazine and a panel of industry experts choose the top Leaders in each industry, including banking and finance, healthcare, law, lifestyle, professional services, real estate, and technology and manufacturing. Since joining Jones, Skelton & Hochuli in 1996, Mike has focused his practice on defending developers, owners, subcontractors, design professionals and product manufacturers in matters involving construction defect, personal injury and wrongful death, premises liability, and professional liability. Currently serving as the Vice Chair of the Premises & Security Liability Section of the Federation of Defense and Corporate Counsel (FDCC), Mike is a past-President of the Arizona Association of Defense Counsel (AADC), has served on the Construction Law Steering Committee for the Defense Research Institute (DRI), and is past Chair of the USLAW Network’s Construction Practice Group. He also leads the firm’s Construction Litigation Trial Group.